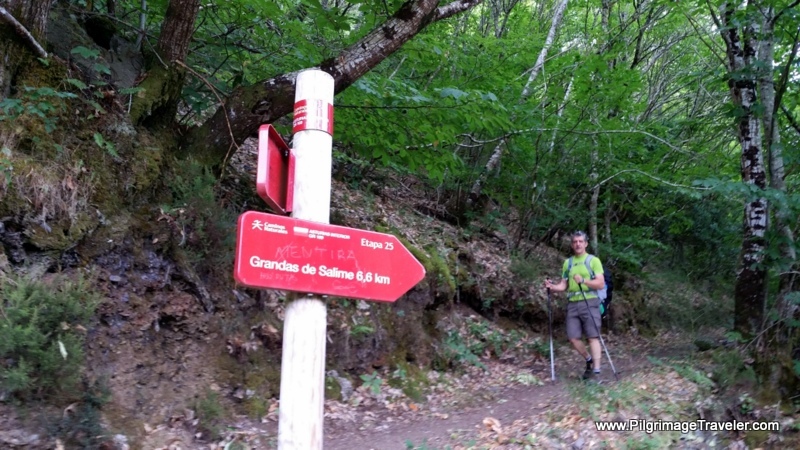 On day six of my Camino Primitivo, it was all about pushing through the adversity of physical challenges. In my prior days writings, I had alluded to my chest constriction, sore throat and sinus drainage issues. Well today, I was just physically exhausted most of the day, with my physical symptoms now culminating in full blown laryngitis and perhaps bronchitis as well. For some reason, I thought that after completing the Hospitales Route on day five, most of the challenges of the Original Way would be over. Not so! Upon completion of my day six on the Camino Primitivo, I realized that this was truly a rugged, lonely and amazingly beautiful Camino. 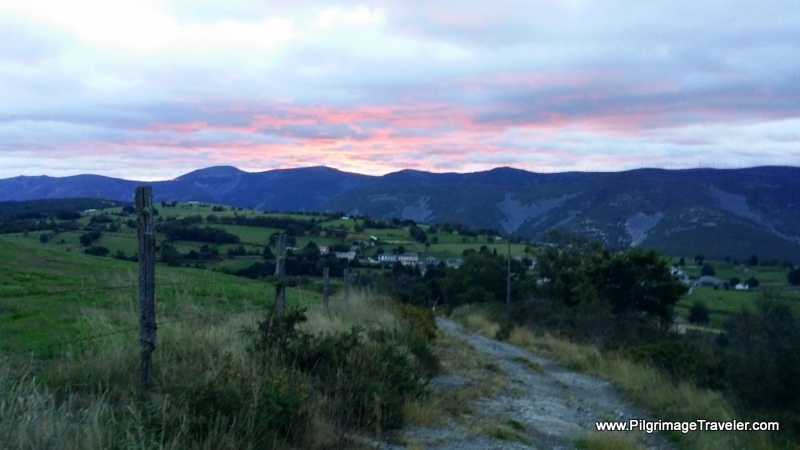 As I listened to my voice journaling from day six of my Camino Primitivo, I repeatedly heard the frustration and exhaustion in my voice. Plus, I could hardly speak. My post-nasal drip, as I had feared, once again turned into laryngitis. While my throat wasn't as sore in this stage, my coughing became my new companion. This was especially true after a long night of sinus drainage, causing the hacking that kept me from a good night's rest. 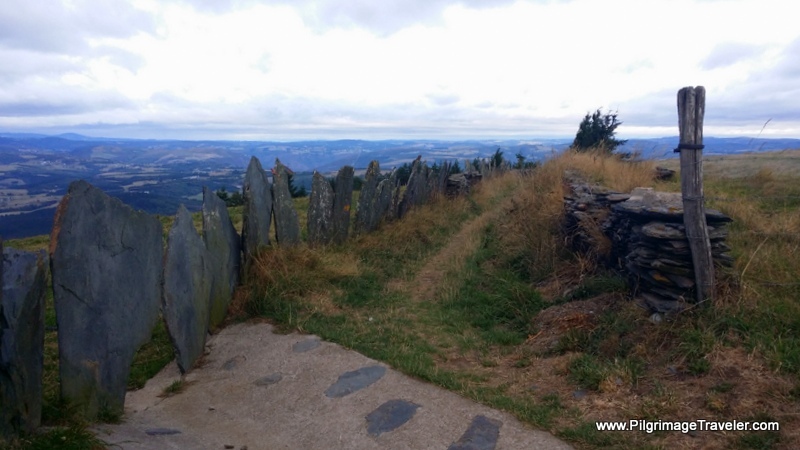 While I tried to contemplate on the meaning of my missing voice and the 5th Chakra energy issues, throughout my entire day six on the Camino Primitivo, I never did come up with an answer. Perhaps the sheer energy requirement of this and prior days had merely taken its toll. But I was tired - tired of hills, tired of my feet hurting by midday, tired of the physical pounding on my body, tired of coughing, tired of being sick almost since the day I set foot in Spain. And still, I pushed on. 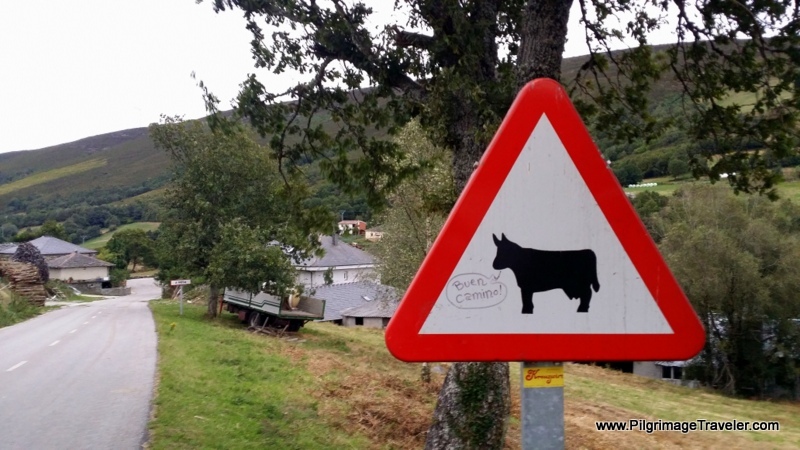 This is my tale of day six on the Camino Primitivo. Despite my illness, we managed to complete 25.49 kilometers. The "family" plans were to meet up in Castro, but I didn't know if I had that distance in me. I would take the day as it came. The first 5 km from Berducedo to La Mesa is quite flat and nice, but the fun ends there. The rest of our day six on the Camino Primitivo is nothing but long, long hill climbs and punctuated with very steep downhills to boot. 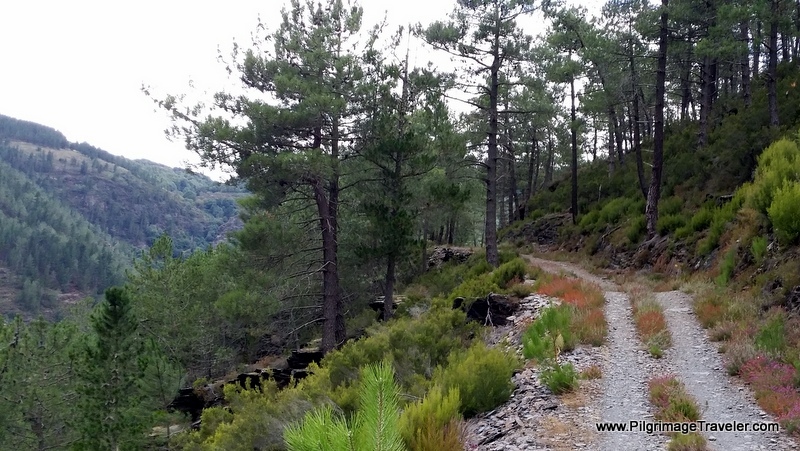 The downhill from Buspol to the Embalse de Salime reservoir is torture on the legs and feet, but at least it is in lovely forest paths that are not paved! As you can see from the elevation profiles, the loss of elevation from the high point after La Mesa, in Buspol, to the reservoir is more than 800 meters (2600 feet) over 8.0 kilometers! If you have never done this type of elevation loss in your life, let me tell you how brutal it is! 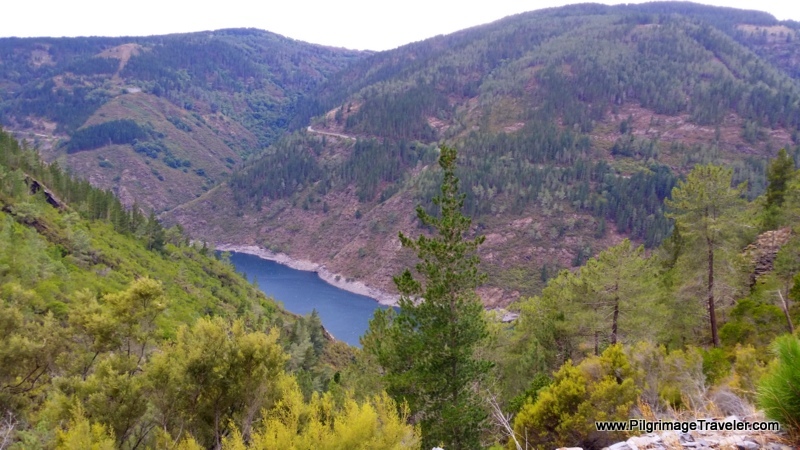 Then, of course, from the reservoir, is the inevitable climb to Grandes de Salime and onward to Castro, a gain of about 440 meters (1500 feet)! Come mentally and physically prepared for this day, and plan lots of rest breaks! After leaving the Bar Casa Marques in Berducedo, the Original Way joins the AS-14 and soon veers to the left on a path. From town, the path climbs up and out on country lanes for about two or so kilometers. The weather was cloudy and blustery this morning, and it looked like it would rain. As we left town, we could hear the ubiquitous tinkle of cow bells. 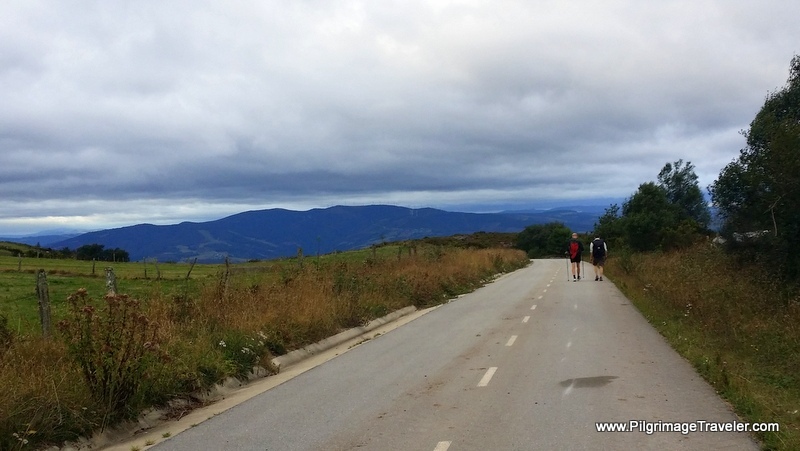 It was a lovely sound to start our day six of the Camino Primitivo. Rich and I soon caught up with James, our British family member. They ambled on ahead, on long legs, while I relished in the music of the forest path in solitude. A short distance later, the Original Way rejoins our old friend, the pavement, and walks us into La Mesa (or variably, A Mesa). I couldn't help take a photo of the sign, below, as we entered into town. 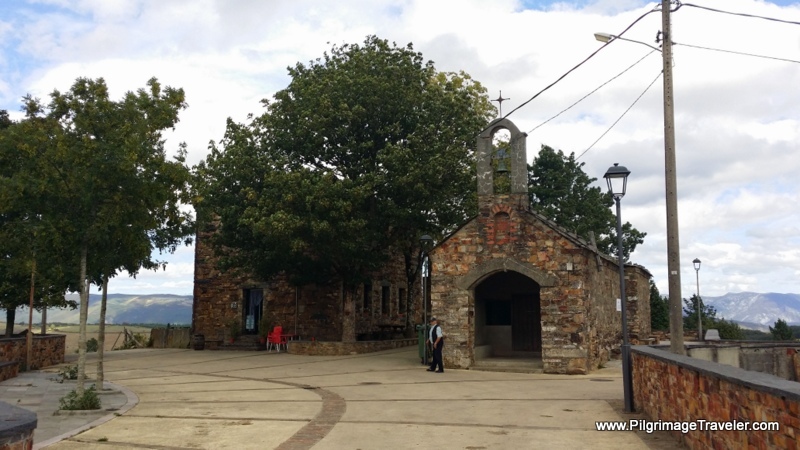 As we walked into La Mesa, the Iglesia de Santa María Magdalena looms above the landscape. The old stone church reflects the grayness the day had taken upon itself. I poked around the place, but it was shut tight to intruders. Despite my physical state, I again breathed a prayer of gratitude. 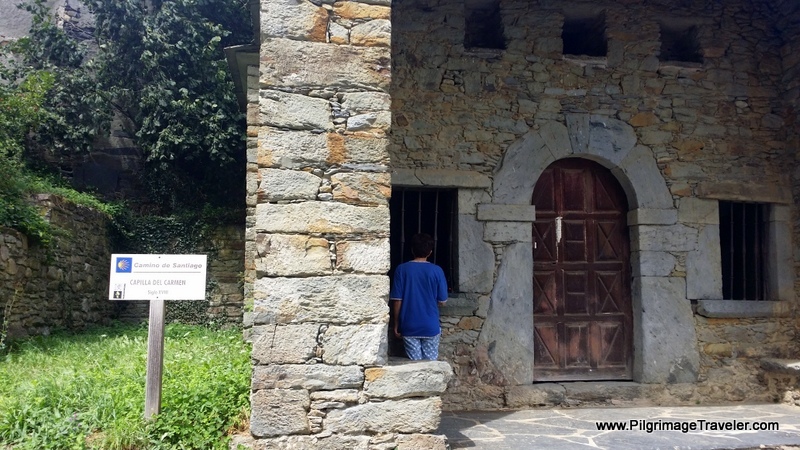 Towards the end of town, we encountered the Albergue de Peregrinos de La Mesa. There is also the private, Albergue Miguelin just across the street. 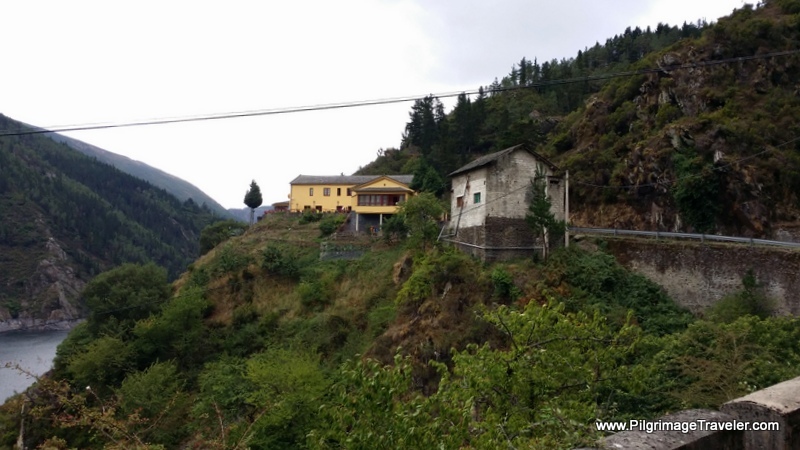 Note the windmills above the albergue- yes, this is our next destination! The Original Way turns right at the albergue in La Mesa. Here the countryside opens wide, and we immediately began climbing up a ridge on the pavement. Being the first climb of the day and with today's reduced energy level, this climb seemed like water torture to me. 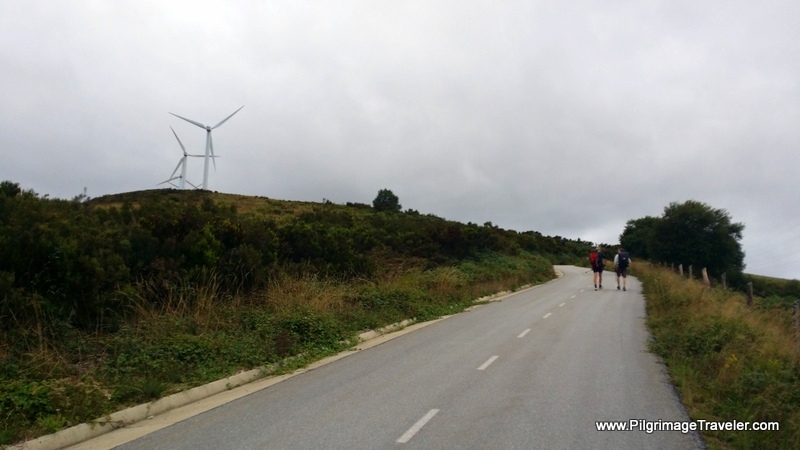 I looked up to the windmills on the ridge and the guys ahead. Hopefully, this was as far as this particular hill went! The sky continued to threaten. I put my head down, and synchronized my steps with my breath. It works in yoga, maybe it would work with walking! I plodded on, one foot in front of the other, to a rhythm that worked for me. 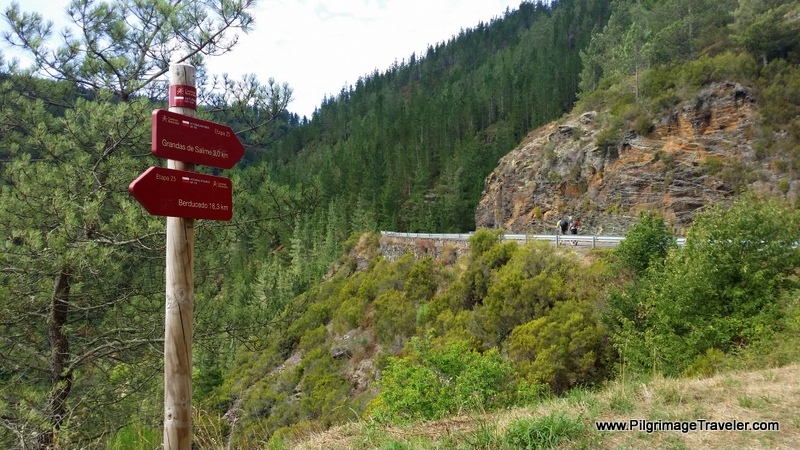 Some kind soul, (or not-so-kind, depending on your perspective) decided to place mileage signposts along the way, only on the stage from Berducedo to Grandas. Throughout our day we encountered these red markers, letting us know of our progress. 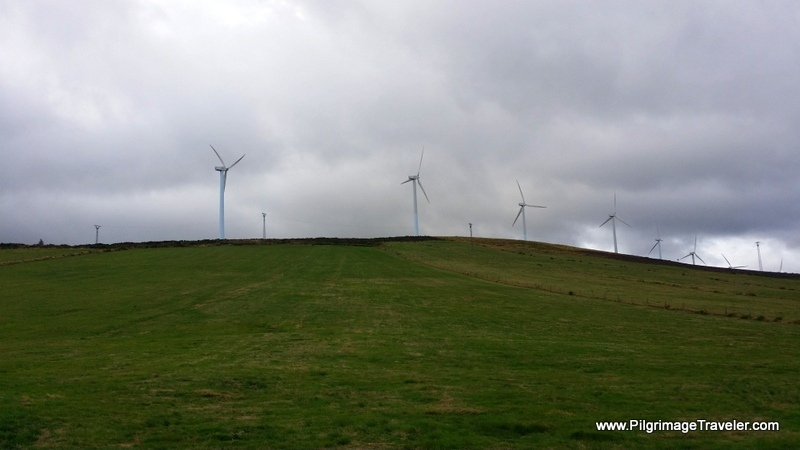 Here we are almost halfway to Grandas, just beyond the crest of the windmill ridge! I had done it. The road never quite reached the windmills, but it was close! Shortly after the ridge crest, we turned right on a lane to walk into Buspol. Nothing much is here except this quaint chapel and dramatic views. This is the highest point until the long descent ahead. After spending a moment or two in silence and gratitude at the chapel, my mood turned from "what the 'bleep' am I doing?" to one of euphoria. This is a most enchanting place, high among the clouds! 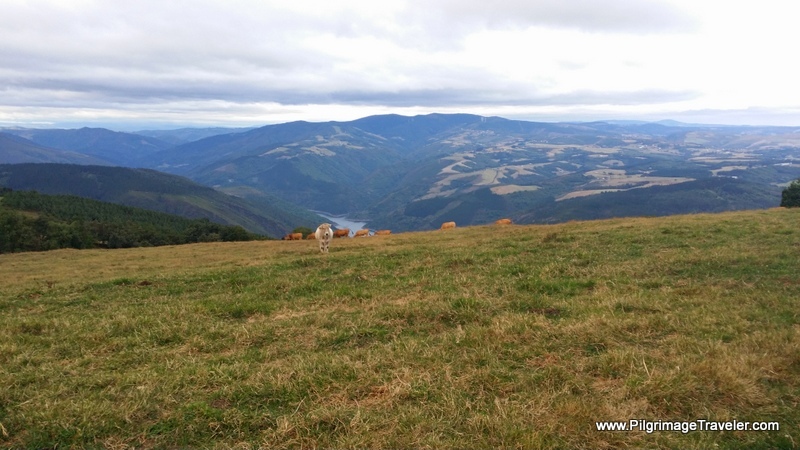 As we headed westward, a high meadow reveals the next goal: the Embalse de Salime, the giant reservoir in the valley below. 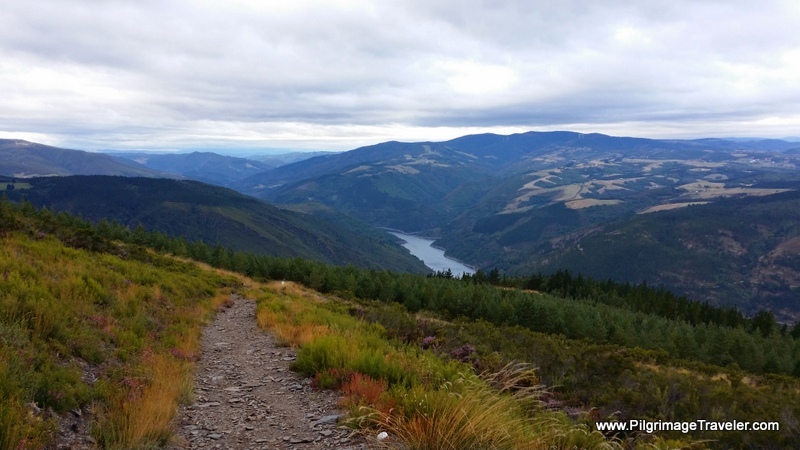 Onward on day six on the Camino Primitivo, the way switchbacks and steepens its descent as shown in the photos below. The terrain and the steepness felt a lot to me like hiking in Colorado, even though the vegetation is not the same. I can't imagine if it would have rained for our steep descent. It would have been a very difficult and slippery descent. For the effort, once again you are rewarded with sweeping views that defy description. In the photo below, do you see the road high above the reservoir on the other side? 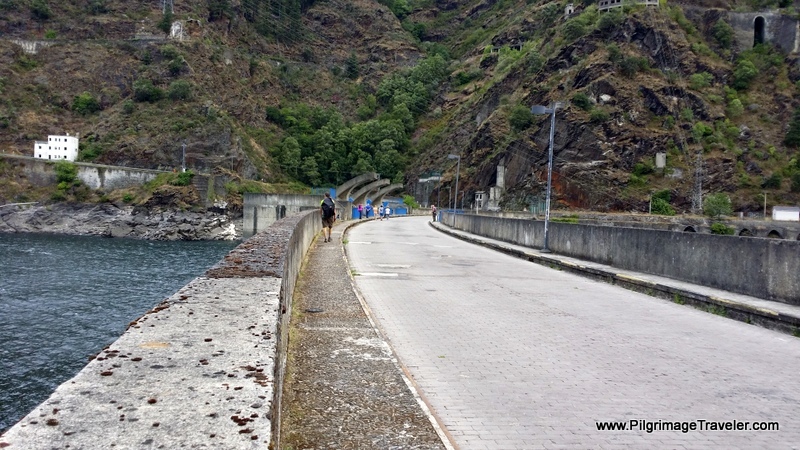 While we didn't know it when we were here, that is the Camino, after dropping to the dam. If I knew then, what I know now, I would have been very, very discouraged. 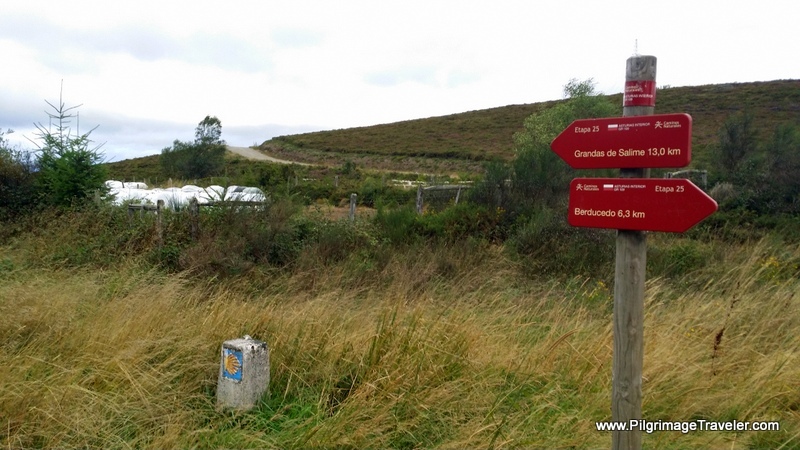 While the kilometers to Grandas were few, the way was not to be easy on this part of day six on the Camino Primitivo. For now, the flat forest lane was a wonderful relief from the steep pounding. It was a lovely place and an easy walk for the time being. Just before reaching the dam, the Original Way switchbacks and drops on a trail, that drops you back onto the AS-14, at this place, pictured below. 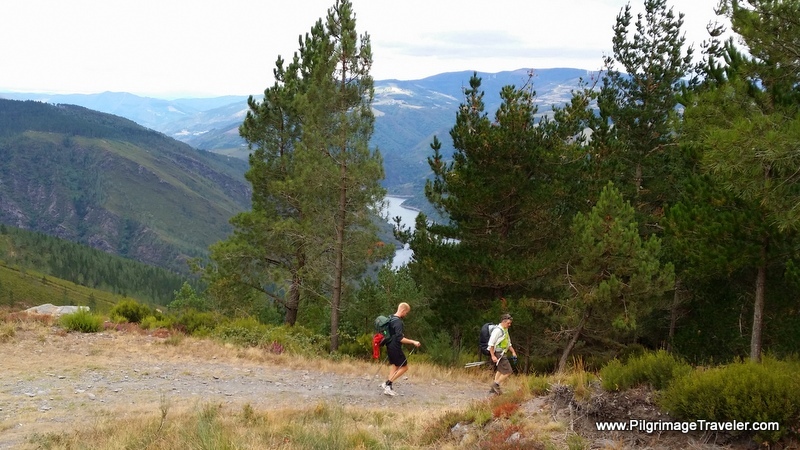 From the high point at Buspol to the low point at the Embalse de Salime, it was almost 8 kilometers and took us one hour and forty-five minutes, with lots of photo stops. 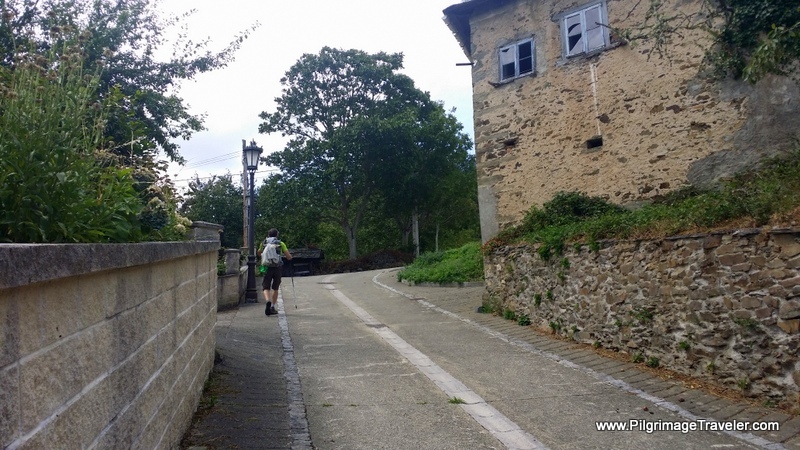 While I didn't track our speed as I walked on the entire day six of our Camino Primitivo, as I write this, and look back, even for being not up to my usual, I didn't do too badly. 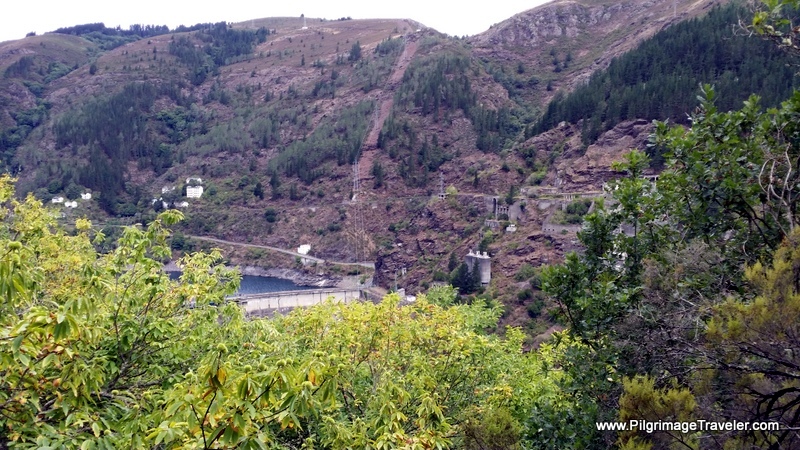 The one kilometer from the dam to the Hotel Las Grandas, pictured below, seemed quite long as we climbed up the hill but we were there a short 15 minutes later. It is recommended that one stops for café con leche at the Hotel Las Grandas, the building in yellow, below. You can see why. We stopped and had coffee and lunch on the terrace with a wonderful view of the reservoir. It was 11:00 and a long, long way from the 7:00 a.m. café con leche and tostada! The hotel has individual rooms, and now has an albergue, if you desire to end your day here! I was learning that every day between 10-11:00 a.m., with about 10-15 kilometers under my belt, I would become extremely tired and hungry. The coffee and toast just didn't serve me enough energy on these long mornings. I tended to get extremely frustrated and crabby if I could not find a substantial, early lunch, even if I had a snack along the way. I was sooooo grateful for the long meal break, and took off my boots to air out my pounded, burning feet. I had made a habit at every break to air out my feet. It definitely helped. I got absolutely NO blisters on my day six on the Camino Primitivo, nor on any day! (See my packing list article for how I managed my feet, if you are interested). 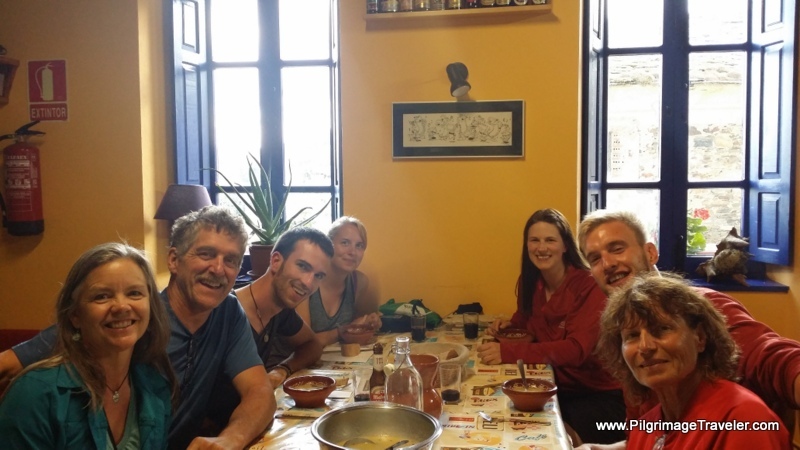 We ran into many Camino family members close to or in the Hotel Las Grandas. Some stopped for a break, some waved as they kept going. The Three Amigos grabbed their backpacks when they saw us coming and hurried on to be first! I couldn't help smiling. (See Day Four for the story). 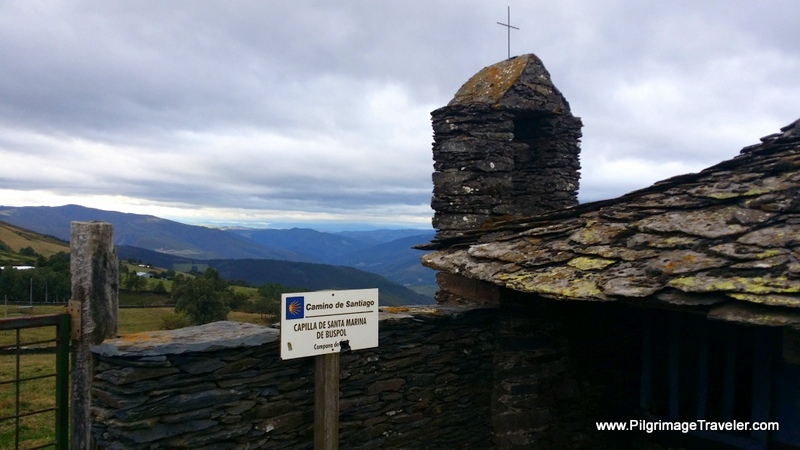 Looking ahead to the second half of day six on the Camino Primitivo, I knew that we had a long climb ahead, up and out of the valley to Grandas de Salime. The Camino, after the hotel is wretched, uphill and almost entirely on the AS-14. I must say, the uphill is easier on the body, but definitely harder on the lungs. My throat was hurting, but I kept going. Trudging up this hill on pavement was boring and another tortuous leg for me. I synced my step and breath once again and trudged on. 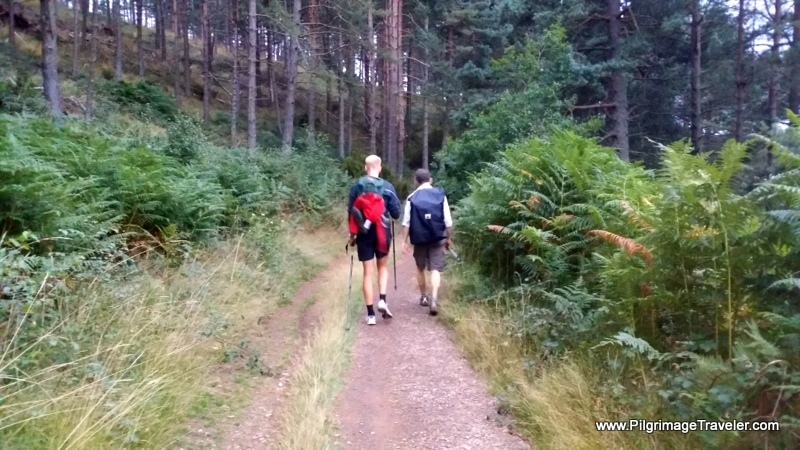 Rich and James were once again ahead of me, chatting away, while I felt like a martyr, "somewhere" behind them. More fortunately, the sun came out and cleared away any possibility of rain, so the afternoon was at least pleasant, weather-wise. Here is a photo. below, of a stretch of the roadway, with only 3 km left to go to Grandas. We got great views as we climbed, looking at the opposite angle to the reservoir. During this long stretch of 4.5 kilometers, on the AS-14, there are the occasional foot paths by the highway, but only where there is sufficient room on the shoulder. There are times when there is no choice but to walk on the roadway. Fortunately, for us, there was not a lot of traffic. Farther along the AS-14, there is a huge hairpin turn (see the map above) and an "área de descanso" or rest stop with picnic tables. This would be a lovely place to stop for a break as well, if you didn't want to stop at the hotel. Immediately after the turn, the Camino leaves the roadway to climb steeply on a trail up and to the left. 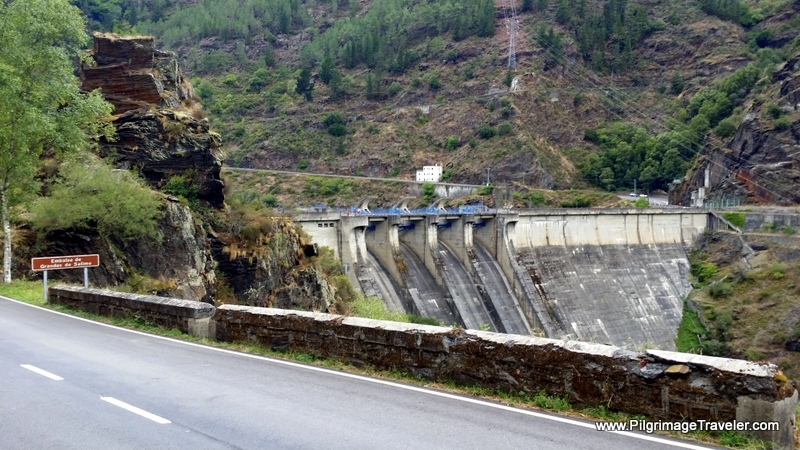 The Spaniards call this place, the Desvio por Senda (meaning detour on a track). I saw this, and was completely discouraged. The map clearly shows the AS-14 goes directly into Grandas. Clearly, we could have stayed on the road and cut out this grueling mini-climb above the roadway. In fact, I am sure some did. But, we chose to keep to the Camino, and take the "track." I am sure it is much safer than the roadway too. It was a nice track and through another forest. 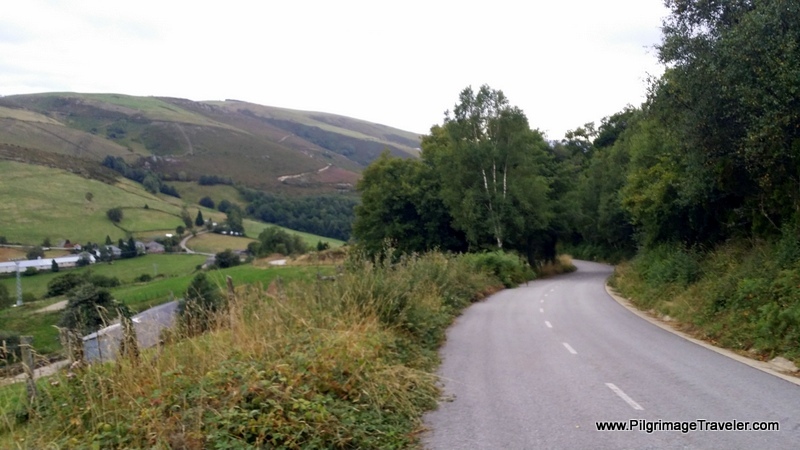 The parallel trail eventually joins a paved path and lets you back out on the AS-14, here at this juncture, pictured below, just before the town of Grandas de Salime, to the right. We passed by the ethic museum in town, that is recommended to see. but we chose not to go. I had more important things on my mind. 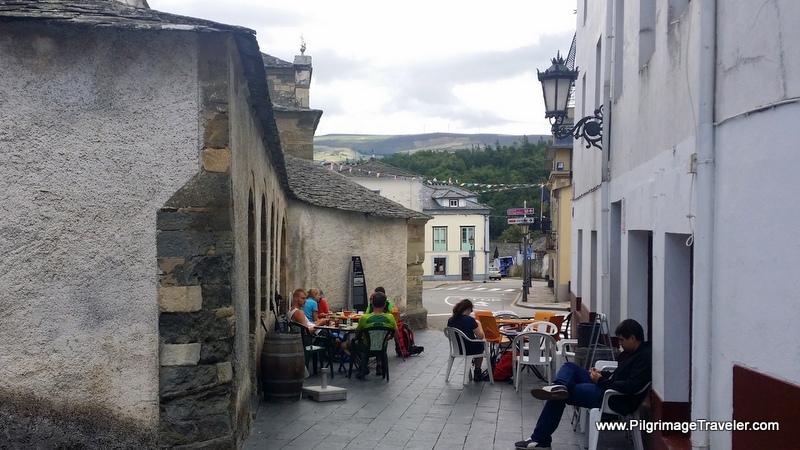 After searching through town for more ibuprofen to treat my throat and sore muscles, we stopped at the Café Bar Centro, a quaint place by the church. The church is on the left, in the photo, below, and the bar on the right, with tables sandwiched in between! While sipping our café we decided to go on to Castro, another 5 kilometers. It was about 1:30 in the afternoon, and still early in the day. I guess the coffee and food revived me enough. 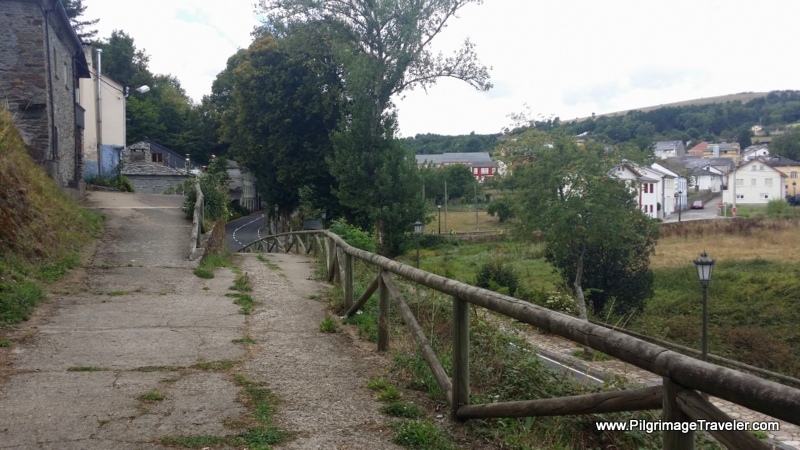 I reasoned that day seven's hill climb to Venta del Acebo would be shorter, and the day itself would be shorter, at a little over 22 kilometers, so why not? I also was jonesing to see the ancient Celtic site of Castro de Chao Samartín, so the decision was final. 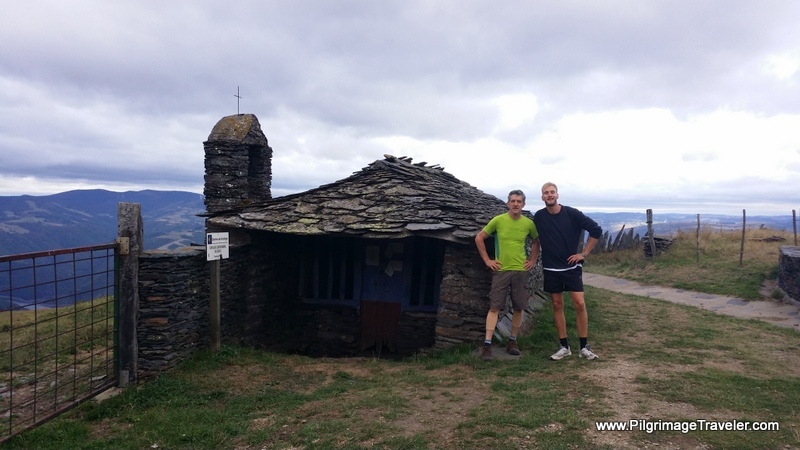 This turned out to be the best decision, as you will see, the climb into A Fonsagrada at the end of the next day, day seven, turn out to be unexpectedly brutal. If you have had enough for the day, there are many services in Grandas. 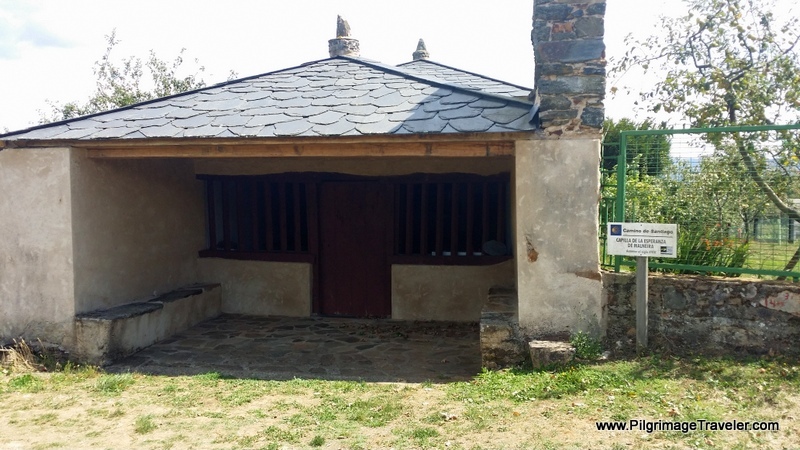 There is the public Albergue de Peregrinos de El Salvador de Grandas de Salime and the A.R. Casa el Ferreiron on the north side of town. There is the Hostal Bar Occidente, the La Barra Hotel and the private Albergue Casa Sanchez in the center of town. Finally on the south side is the Pensión and Restaurante A Reigada. We took off for Castro on day six of our Camino Primitivo, through a back street called the Calle Carmen and by the Capilla de Carmen. A woman was praying here before the window, that peered into the chapel and its altar. 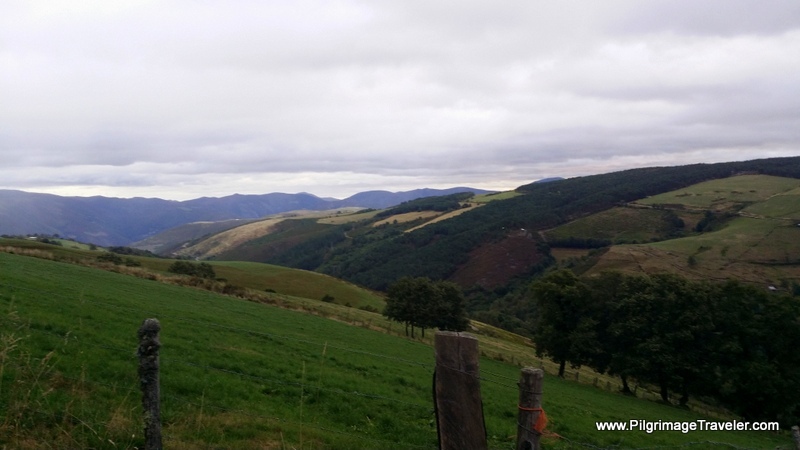 I was grateful for the nice, clear weather on day six, Camino Primitivo and that my ill health was only temporary! 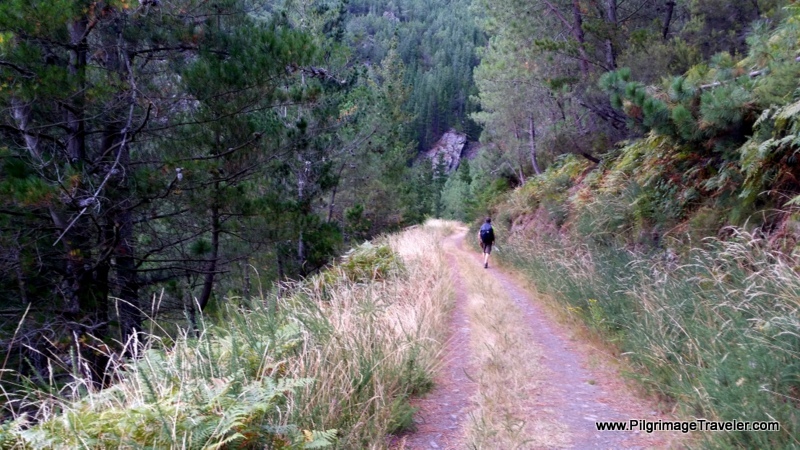 From the Calle Carmen, the way turns into an easy path, but soon joins the AS-28 once again to walk to the town of La Farrapa. The Original Way turns onto a country lane to parallel the AS-28, then into Cereixeira. 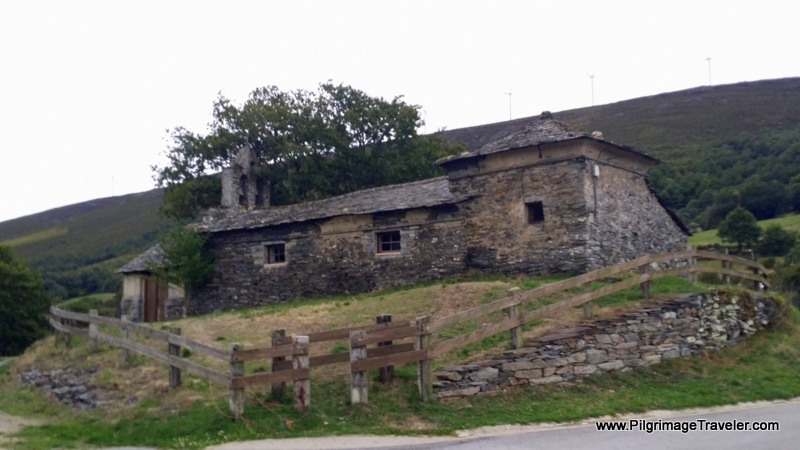 From Cereixeira, another country lane takes you to Malneira, and this pilgrim's chapel. A relatively short stop here was in order, as the end was finally in sight! A short while later we were walking up a small hill and into Castro. All in all, it only took one and a half hours to arrive here from Grandas de Salime, at the wonderfully re-done Albergue Juvenil de Castro. It was just after three in the afternoon. We hurried to do our laundry and shower so we could visit the site of Castro de Chao Samartín. A tour was leaving at 5:00 from the museum, so we had time to join it. Despite the long, hard day, for me it was worth seeing, as I am fascinated by ancient history. This Celtic site hailed back to the 2nd Century, BCE. Upon returning to the albergue, we joined the family, for a wonderful meal provided by the hostess. The rooms in the albergue were lovely, two bunks to a room (four total rooms, I think). The food was delicious and the setting the most charming and quaint. I highly recommend this place. 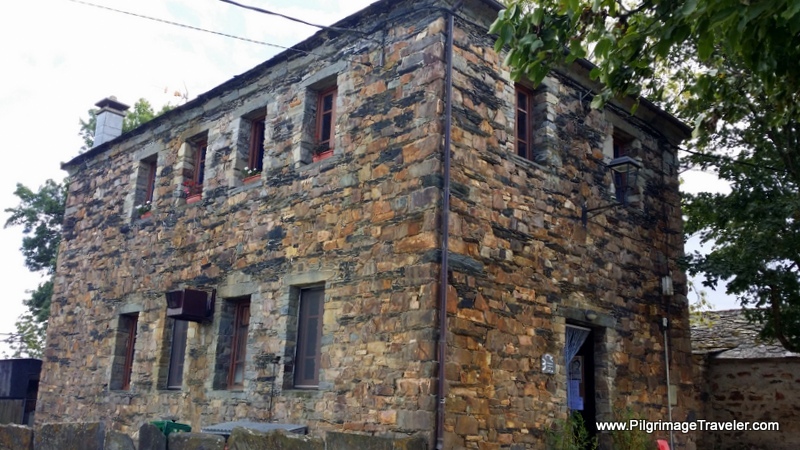 There are several other accommodations in Castro, the Apartamentos Rurales Casa San Julian, the Casa Ferreiro Castro and the Hotel Castro ChaoSaMartín (I could find no web/facebook information - tel: +34 985 62 72 67). 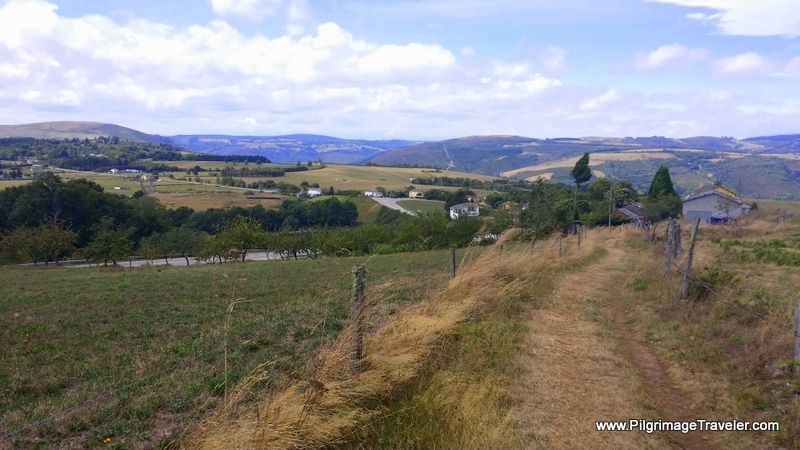 Plain and simple, my day six on the Camino Primitivo was mostly a long-suffering day. I felt this way, even despite the amazing views and ambiance of the journey. While I seemed to have plenty of extra energy to see the historic Celtic site in Castro afterwards, most of my day's walking was riddled with fatigue. I was very tired of feeling subpar, with my sore throat, laryngitis and emerging bronchitis. 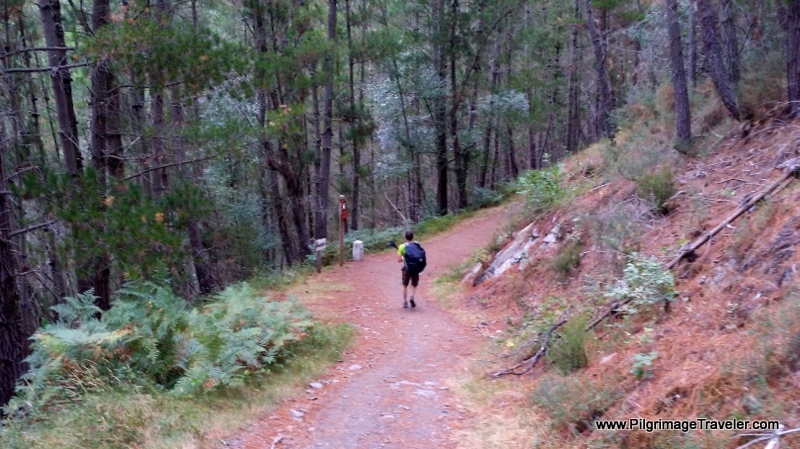 Had I not been on a Camino, I would have been at home, most likely nursing my symptoms with cups of hot tea. Instead, I was pushing myself on the Camino. Did it build my character? Yes, most likely. Would I choose to do it again? Yes, most likely. Mostly, when I listened to myself on this day, journaling into my voice recorder, I would repeatedly say, "this also I shall include." Acceptance of the way it was, virus and all, was the lesson. I failed to be at peace with this several times during the day, but all-in-all I got through it. For today, it was one step at a time. May your own day six on the Camino Primitivo, however long and wherever you are, be filled with acceptance of yourself for exactly where you are. Whether fast or slow, tired or energetic, subpar or full bore, euphoric or melancholy, in full health or ill health, may your Camino be there for you to experience in all its imperfection. May you always find the Grace to be present to what is on your day six of the Camino Primitivo! Buen Camino!